On September 25, 1999, a memorial service for Sander was held in Darwin, Australia. Here you can read the speech of Gwen Robinson, his Financial Times colleague. I was originally intending to say just a few words about the joys of collaborating with one of the best journalists and colleagues I've known. As the FT's Australia-based correspondent, I had the privilege of working closely with Sander for nearly 2 years. But first, I've been asked to say a little about his final day in East Timor. As most of you know, he had taken the initiative in trying to arrange a charter flight to Dili the previous week. He worked ceaselessly on it, until he managed to get there on Tuesday. I last spoke to him 20 minutes before he left for Jakarta airport and we discussed plans to meet. He sounded excited and enthusiastic, as he usually did. We made an arrangement to meet up on Tuesday evening in Dili. On Tuesday afternoon, I was out when he arrived at the Hotel Turismo compound, where many journalists were staying. He left his bags in my room and wandered outside. I must stress at this stage that the atmosphere in Dili that day was very positive. Thousands of refugees in the streets had been cheering the arrival of UN troops since the previous day. For the first time in weeks, there had been no shooting and no reports of violence for a full 24 hours. There was no sense of threat. Journalists were renting motorbikes from locals, or hopping on the back of motorbikes to go out and about the city. It was natural that Sander -- being the kind of journalist who would want immediately to take the pulse of the community, to know what the situation was really like - would do the same. A motorbike rider had just dropped off another journalist at the compound and Sander struck a deal with the rider. 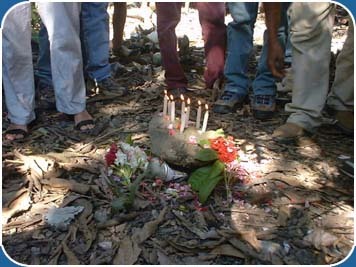 They headed for Becora, a strongly pro-independence area of Dili that was targeted by militia in the violence. The rest has been reported with varying degrees of accuracy and unfortunately, a big degree of sensationalism. What we know now - and I hope you, Peter, as his family representative, and Ian, his partner, don't mind if I put this on the record - is that he died quickly. The circumstances, however,and the identity of his killers is another question. I would urge everyone to push for a quick conclusion to the official investigation announced by Interfet. Now if I can turn to Sander as a journalist and highly valued colleague. Few I have known can write about bond markets, military politics, debt rescheduling and street poverty in a single day - let alone write about such a diverse range of subjects well. Even fewer can do it in at least two languages in prominent publications across several regions of the world. Sander was one of the few. I only realised the extent of his talents when I relieved him last year in Jakarta. He handed me his impressive list of contacts, his mobile phone, keys to his house and his computer, and went off. He was a very hard act to follow. I couldn't believe how plugged in he was across all sectors in Indonesia, how many friends, contacts and deep knowledge he had. What particularly struck me was his lifestyle, his middle class Indonesian house in a middle class neighbourhood. Few foreign correspondents bother to go as "native" as Sander did, even fewer bother to learn a language with the level of fluency Sander attained. It was this sort of philosophy, the drive to get right inside, which helped give him such insights into Indonesian society. For me, he was a constant source of ideas and insights on the stories we were both covering. Our relationship was conducted largely over telephones and computers. By mid this year, we were talking nearly every day, invariably about Timor or Indonesian politics. He was always inspiring, encouraging and enthusiastic - and utterly professional. His outstanding coverage in Indonesia and other parts of the world was noticed by all kinds of people in many different walks of life. I can't think of any other 30-year-old journalist who would receive the kind of tributes now pouring in, from the UN secretary general and the White House to governments and organisations around the world. Not to mention the many friends who loved and admired him. In many, many ways, Sander Thoenes will be an impossible act to follow.